RHB Gets Flaks From Militant Gabriela! 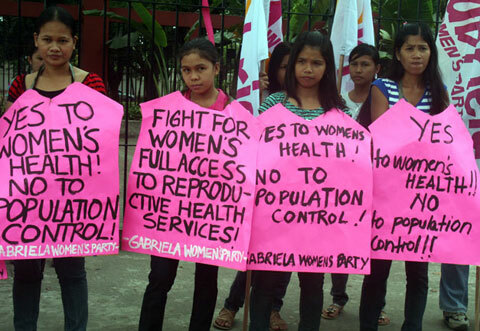 Gabriela, a woman cause-oriented group came out with a position statement on the hotly contested Reproductive Health Bill (RHB) in Congress. I am not a “Gabriela” fan whose overarching bias against “U.S. Imperialism” blinds itself to the realities of our own guilt. I think, we are poor because we have not freed ourselves from the economic slavery of our own elite; and the more we lash at our convenient bogeymen, the imperialists, the more that we blur our vision to the real cause of our economic malaise. One perceptive writer said that if we keep pointing to foreigners as the source of our problems, the three other fingers are pointing to us. And if we keep looking hard enough, we can see that our enemies are us! It is for this reason why I was not a Gabriela fan. But lately, the militant female group bucks RHB’s population agenda and claimed that poverty was not chiefly caused by population growth but by the disparity in the economic distribution. Its position on the subject reinforces my own view on the matter. Gabriela, I supposed, deserves a second look. With uplifting the reproductive health situation of Filipino women, especially the poor, in mind, GABRIELA National Alliance of Women deeply appreciates the continuing efforts of legislators and advocates to push for the passage of the Reproductive Health Bill. We, however, would like to express our concern at how the ongoing debates inside and outside of Congress on the Reproductive Health Bill appears to highlight the crafting of a national policy with a population control agenda. We are concerned that such framing of the debate overshadows the bill’s positive provisions, specifically its commitment to ensure as a matter of state policy and responsibility women’s access to healthcare and women’s right to informed choice. GABRIELA remains firm in its stand that population growth is never the culprit for our nation’s poverty and thus population control is never a solution. A population control agenda that pins the burden of our nation’s development on women’s bodies poses a grave threat to the health, rights and welfare of Filipino women. Masquerading as a poverty alleviation measure, this agenda toes a misguided proposition that a way to end poverty is to control family size. We fear that this myopic and guilt-flogging view will give undue pressure on women to control their reproductive functions and may lead to further violation and sacrifice of women’s health, rights and welfare. Because we have a stunted pharmaceutical industry, a reproductive health policy anchored on a population control agenda will legitimize the exploits of huge pharmaceuticals and multinationals raring to make super profits without regard to the quality of contraceptives, reproductive health medication and services that will be made available, or worse, imposed to Filipino women. This runs contrary to our vision that no Filipino dies of complications of pregnancy and childbirth and other reproductive system related illnesses and that children are born healthy to mothers who are also healthy enough to care for them. We also believe that profit-driven delivery of reproductive health medication, supplies and services is an alarming deviation from ensuring that the government, as primary duty bearer in guaranteeing the people’s welfare, takes to task its responsibility to promote women’s health. Lastly, we strongly believe that pinning the burden of our people’s poverty on population growth is hinged on a misguided analysis of the root causes of widespread poverty and inequitable wealth distribution in the country. To rest on population control as a framework for solving poverty eschews from the path of addressing the true causes of our nation’s poverty by working towards social justice and equitable distribution of wealth and resources. GABRIELA has already called the attention of our legislators, especially the authors of House Bill 4244, on these concerns. We have urged them to take the population control agenda out of the RH Bill, specifically the framework and provisions of HB 4244 that buffer a population control agenda, including the following: Section 3, Letter (L) of the Guiding Principles; Section 12, Integration of Responsible Parenthood and Family Planning Component in Anti-Poverty Programs; and Section 25, Letter (I) of the Implementing Mechanisms. For the interest of Filipino women, especially the poor and marginalized, GABRIELA vows to be steadfast in fighting for a genuinely pro-health, pro-poor, pro-women reproductive health legislation and policy. June 1, 2011 in abortion, contraception, contraceptives, reproductive health bill. The Church Rages Over Condom Distribution! ← Bongbong Hopes To Become President Like His Father!